I am a sucker for a labyrinth (the kind you walk, not the kind with David Bowie and freaky Muppets.) Any time I visit a camp, church or cathedral, I always check. If they’ve got one, I’ll walk it: indoors, outdoors, made of brick or gravel or canvas, whatever. 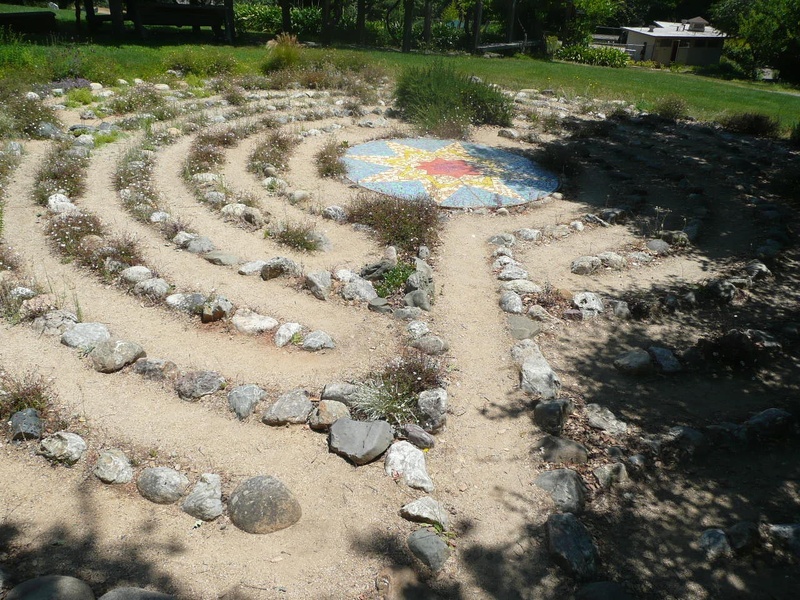 One time, during an Episcopal clergy wellness conference, I walked this outdoor labyrinth twice a day for eight days. I love walking a labyrinth at night, or during the day. I love the spiritually different experience to be had when walking with others vs. alone. Sometimes it’s nice to have music playing, or to be in total silence, or to have the sound of the city in the background. It’s not for everybody, the labyrinth. It takes a while to walk, winding all the way in and all the way out on that same path, and it’s monotonous, and you may start to wonder if it will ever ever end. (Some allegedly spiritual experiences are like that.) And you probably know this, but it bears reminding you that there is a difference between a labyrinth and a maze, where you can get lost or hit a dead end (think of poor Cedric Diggory.) 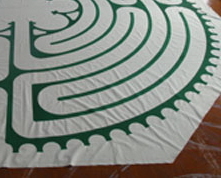 A labyrinth is a single path, with no uncertainty or possibility of screw-ups. I find the combination of repetition and movement and concentration on my next step to be soothing, like a lullaby. This walk is physical prayer, not unlike the benefit of using prayer beads: the repetition frees the mind and spirit to be available to the still, small voice of God. The walking, the turning, the doubling back are all part of it. The other day at a conference, I bailed out of a meeting that was bringing me down, and after a little wandering found myself at the edge of a canvas labyrinth elsewhere in the building. I took off my shoes and my meeting nametag (that part seemed important, to shake off the mood I was in) and took my time walking the path painted on the fabric. As I went, settling into the repetition, I started to notice something. At every turn, some previous pilgrim had left little pinwheels in the fabric as they pivoted around the corner. The path was smooth, but the turn-arounds were adorned with these beautiful little inadvertent designs twisted into the canvas. I thought of the small pleasures and blessings that can come from turning, changing direction. I thought how, yet again, a blessing from God can be found in a tiny detail. We are not always meant to keep heading in the same direction, but we can trust the one path. We have a labyrinth at work that I walk on particularly difficult and not hot days. Makes all the difference.